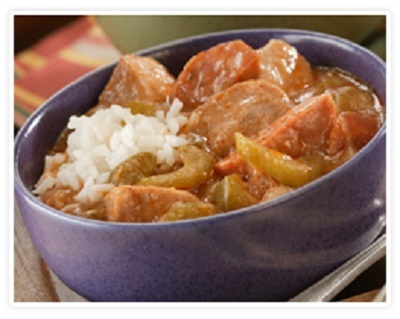 Enjoy this Creole Style Pork Stew that is chock full of flavor. Pork, sausage, tomato paste, seasonings and more make this a hearty and delicious stew. Make a roux by heating oil in a large, heavy pot over low heat. Stir in flour; cook and stir over low heat until mixture turns a rich red-brown color (about 20 to 25 minutes). Remove from heat; carefully stir in onion, celery, bell pepper and about 1 cup chopped sausage. Return pot to heat; cook and stir 5 minutes over medium heat. Stir in garlic, chicken stock or broth and tomato paste. Add Worcestershire sauce, bay leaves, sage, oregano and cayenne pepper; bring to a boil over high heat. Discard bay leaves and skim any visible fat, if desired. Add salt, pepper and hot pepper sauce to taste. To serve, spoon 1/2 cup rice into shallow soup bowls; ladle some of pork mixture over top. Add more hot pepper sauce, if desired. Variation: Add 1 pound okra cut into 1/2-inch pieces during the last 20 minutes of cooking time. This recipe was developed by Chef Bruce Aidells, author of Bruce Aidells’s Complete Book of Pork.